The first preseason week is in the books. I hope you enjoyed the chaos of it as much as I did while earning some extra bills on the side. Thursday’s slate is a three-game slate featuring PHI at NE, NYJ at WAS, and PIT at GB. The concise nature of a smaller slate emphasizes building a strong core of players in your player pool in order to come out winning. Chalk is fine here with a few contrarian options sprinkled in but playing time and projected touches need to be our focus. Jets head coach Todd Bowles continues to keep his plans under wraps, but from practice reports, we can gather that it looks like Sam Darnold should get the starting nod this week and run with the first team. Last year at this time, Bowles started Christian Hackenberg in the second preseason game and let Josh McCown sit. Two full quarters of Darnold makes him an ideal quarterback option for tonight’s slate. In the quest for clarity, we found it in spades when it comes to the Steelers quarterback playing time. Joshua Dobbs and Mason Rudolph will be featured exclusively in this matchup with each taking a half. 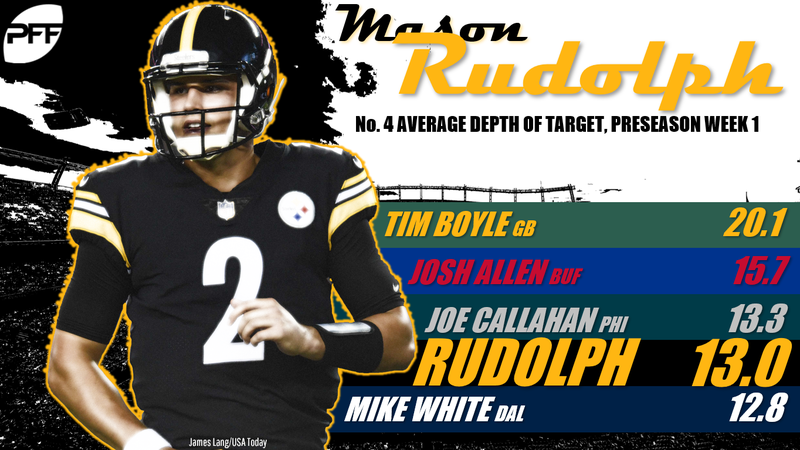 At the time of this writing, the starting quarterback is unclear, but Rudolph has my interest here with his more aggressive downfield throwing (8.42 yards per attempt last week). That aggressiveness is exactly what you want in DFS tournaments. He makes for an ideal stacking option with downfield threats James Washington (13.3-yard average depth of target) and Damoun Patterson (19.7). The injury bug is running rampant in Philadelphia’s running back room, but it does narrow down our player pool of backs we expect to see get touches. Matt Jones and Wendell Smallwood are two guys who may see extended looks simply by attrition, but we’ll take the expected narrow distribution of touches any day of the week in preseason. Jones (6-2, 240 pounds) could be a workhorse against second-stringers and a bulldozer on the goal line. Both guys are in my player pool for tonight’s slate. The injury to Derrius Guice diminishes the number of backs we can expect to see touches for Washington. Byron Marshall and Kapri Bibbs are both end-of-the-roster guys vying for a chance to make the 53-man roster. Bibbs broke free for a 41-yard run while Marshall had a 25-yard receiving touchdown. Both are potential big-play options that should see extended looks in the second half. Injuries have also hit New England, where we can see a diminished touch distribution between Mike Gillislee and Ralph Webb. Jeremy Hill hurt himself Monday and didn’t practice Tuesday (check for status update before kickoff), and if he’s out, it could lead to extended playing time for Gillislee. Webb was awfully impressive last week (14-46-2) and should draw high ownership this week. Green Bay’s wide receivers provided big fantasy outings last week with Marquez Valdes-Scantling (5-101-1), Equanimeous St. Brown (4-6-0), and Jake Kumerow (3-76-1) all providing quality stat lines. Sometimes it’s prudent to just ride the hot hand and continue to roster these young guys while they build on their chemistry with Brett Hundley and DeShone Kizer. Maurice Harris is looking like he has the inside track to locking up Washington’s No. 4 wide receiver duties after having a very strong camp. He led Washington’s wideouts in targets and routes run last week and has good size at 6-2, 195 pounds. Cam Sims is a deeper name worth considering given his 6-5 frame. He hauled in a 57-yarder last week could see more snaps now that Washington placed Robert Davis on injured reserve. A Nelson Agholor injury has led to Greg Ward practicing with the Eagles’ first-team offense in the slot this week. Ward made a name for himself last preseason in Philadelphia, nearly making the 53-man roster and could see a lot of shallow over-the-middle looks from Nate Sudfeld. Shelton Gibson hauled in a 63-yard touchdown last week, and while others chase last week’s production, I’ll be pivoting to Bryce Treggs. Treggs had more deep targets than Gibson (4 to 3) and ran more routes (23 to 16). Dallas Goedert looked the part of an NFL tight end last week and succeeded when asked to block downfield in various ways (whams, pulls, point of attack). The do-it-all tight end could be a slate-changer once again, especially when the Eagles get near the red zone. His 16.6 DK points trailed only David Njoku (18.6) as the second-highest fantasy scoring tight end last week. The Jets are down to just two healthy tight ends entering Thursday’s game in Jordan Leggett and Eric Tomlinson. Leggett’s the far more athletic play here with higher upside. The hype train for Hollister continues to gather steam (hint: stash now in dynasty leagues). I’ll also be sprinkling a bit of Jeremy Sprinkle into lineups this week. He’ll likely go overlooked by many, but he’s had an outstanding week of camp in joint practices, making an impact downfield working the seam. He led Washington’s tight ends in routes run last week and could be a contrarian option.